39. Investigation of the Kernel Functions "in the Little"
The Theory of Finitely Generated Commutative Semigroups describes a theory of finitely generated commutative semigroups which is founded essentially on a single "fundamental theorem" and exhibits resemblance in many respects to the algebraic theory of numbers. The theory primarily involves the investigation of the F-congruences (F is the the free semimodule of the rank n, where n is a given natural number). As applications, several important special cases are given. 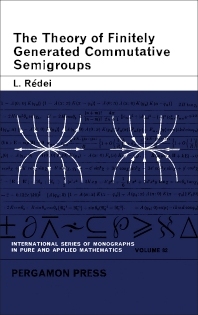 This volume is comprised of five chapters and begins with preliminaries on finitely generated commutative semigroups before turning to a discussion of the problem of determining all the F-congruences as the fundamental problem of the proposed theory. The next chapter lays down the foundations of the theory by defining the kernel functions and the fundamental theorem. The elementary properties of the kernel functions are then considered, along with the ideal theory of free semimodules of finite rank. The final chapter deals with the isomorphism problem of the theory, which is solved by reducing it to the determination of the equivalent kernel functions. This book should be of interest to mathematicians as well as students of pure and applied mathematics.